Weight is a very important performance factor in motorsport and for passenger cars. One of the first things we learn in applied maths is Acceleration = Force / Mass. OK actually we learn F = M*A but it’s the same thing right? What’s clear is that a lighter car will accelerate more or require less force to accelerate like a heavier car. 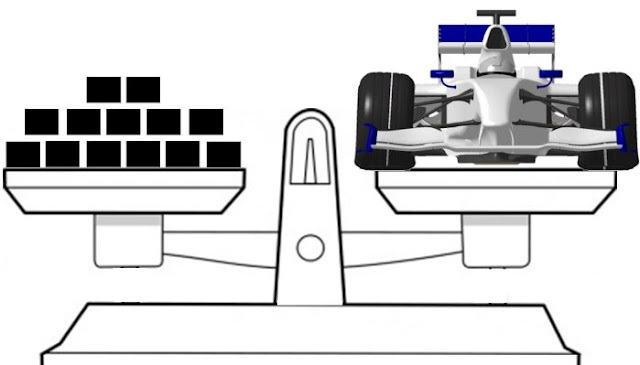 All F1 cars are forced up to a minimum weight (mass) by the regulations. In 2012 the minimum weight of the complete car without fuel but “…with the driver wearing his complete racing apparel…” had to be no less than 640kg (already heaver than some years before). For 2015 that number is 702 kg mainly to make it possible for the smaller teams to fit the energy recovery systems the cars run as part of the new powertrains – and still be on or close to minimum weight. That difference in starting mass makes the cars about 1.7 seconds a lap slower around an “average” Formula 1 race track. Not that interesting in itself, but what are the main mechanisms at play? All that mass has to be accelerated by the powertrain – so the cars accelerate more slowly once there is enough grip to put the power that’s available on the ground. Engineers will often talk of “power to weight ratio” – because in the early phase of having enough grip this determines acceleration. As the acceleration is slower with a heavier car of the same power, you have to accelerate for longer (more time) to cover the same distance so you use more fuel. F1 (and Sports) cars are limited in how much fuel you can use so you have a double negative (you have to reduce power a bit or you’ll use too much fuel compared to having a lighter car). Top speed will only be a little down on the longest straights because at high speed the drag, effectively, becomes dominant. Braking power is, to all intents and purposes, unlimited and, in fact, a heavier ERS car will recover more kinetic energy than a light one in the ERS braking phase – because it has more kinetic energy. None the less, some time is lost in braking a heavier race car (we’ll come to that soon). Probably the biggest single loss of time though is in the corners (depends on the layout of the racetrack). Two main mechanisms work together here to disadvantage the heavier car. Firstly and most importantly is the aerodynamics of the car. A race car creates downforce from the air it passes through which pulls (mainly as most of the force is created under the car) and pushes the car onto the ground. Once higher speeds are reached this starts to have a significant effect. If we add 640 kg of downforce to a 640 kg car then the tyres will see exactly 2 times the weight of the car at that speed. If the car weight is changed to 702 kg then the ratio is 1.9. That is the main mechanism that makes a light car with downforce faster around a corner than a heavy car. It is only the mass (of the car) that has to be “accelerated” – not the load created by downforce. This picture is not a Formula 1 car but the concept is the same – it applies to any car with downforce. The tyres too have their role in making a heavier car slower around a race track. It’s worth stating that tyres (written as “tires” in some parts of the English speaking world) have improved dramatically for passenger cars over the last 50 years. However for both road cars and race cars there are some common trends. 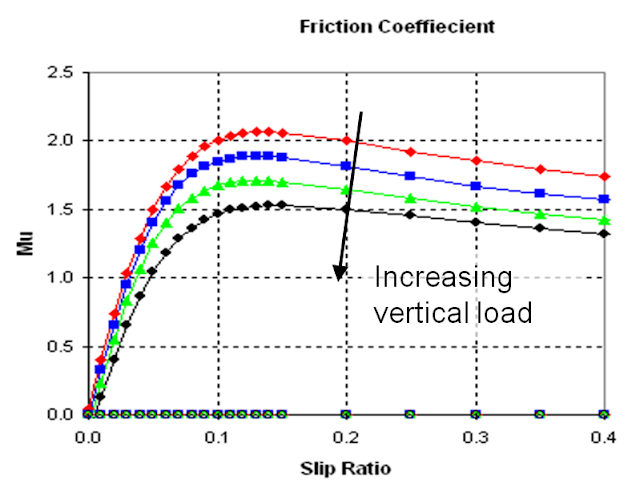 Rubber effectively becomes harder as it is put under more load. This also translates to less grip (all other things being equal such as tyre temperature and condition etc). I don’t own this picture and I don’t know who does – if it’s you, THANKS - let me know. 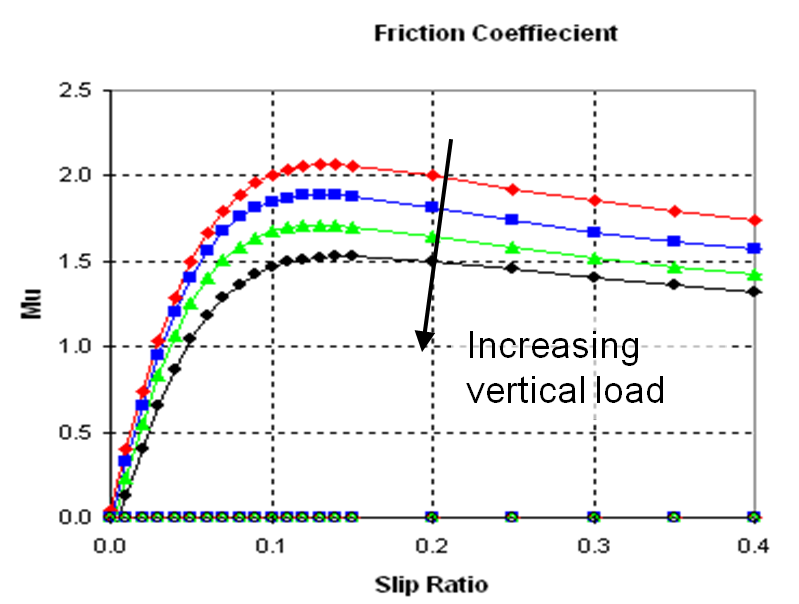 So in case you’re still thinking about why braking distances are longer for a heavier car it is simply because the tyre friction is slightly lower because the load is heavier (assuming the same tyres). In racing categories, normally, a minimum weight is imposed for reasons of safety and equality. Reducing weight is so beneficial that teams would – and used to – take big risks with structural integrity and component stiffness to achieve lower weight. Even with minimum weights imposed also materials we can use are limited. For example we cannot use materials with more than a certain specific stiffness (these materials tend to cost mega money and also can be brittle). We can’t use depleted uranium for ballast (denser than Tungsten but tends to have some residual radioactivity which is not good – especially for the driver). A trend can be seen on road cars of the last 40 years where, for reasons of safety, cars have tended to become stronger and more crashworthy but also significantly heavier. For example, “From 1980 to 2004 … the attributes of a Honda Accord have changed significantly. Weight has increased by over 50 percent, while horsepower has nearly tripled.” Between 1999 and 2005 the Accord’s NHTSA Safety Rating also increased from four-star to five-star. Despite this tyre development has resulted in improved grip and cornering speeds / braking distances. However that is a development story for someone else to tell. While we’re talking tyres I think it is appropriate to mention…. Wider tyres on road cars work (and the difference is not huge) because the load per unit area (road contact area) is reduced so the grip is slightly higher due to the properties of rubber. That applies in the dry and it applies in the wet as well from all the studies I’ve seen – but only up to the point of aquaplaning. Aquaplaning happens when the tyres are no longer able to cut through water on the road to make contact with the road itself. On ice, narrower tyres are better, Modern winter tyres seem to have made the “problem” of wide tyres on ice less severe but it is still true. With homologated tyre sizes you can’t do too much about it these days with road cars but it used to be possible and very beneficial. After years of optimisation for weight, the F1 teams have developed incredibly light-weight but effective safety structures including a protective monocoque and light energy-absorbing structures, which are needed to pass various crash tests. Of course, given the extreme nature of the sport, safety is also being evolved generally in F1, in the drive to keep human beings as safe as possible. The sport is of course inherently dangerous, but is constantly evolving to make it better. Safety structures is one area where racing can be contributing to normal passenger cars. 2 Dec 18:30 to 20:30 plus Oxford - Free public lecture - F1 Performance, Design and (maily) Aerodynamics see toet.eventbrite.co.uk There will be some entertaining stories and time for questions. Free, book early. This is the one to aim for if you work as it starts at 6:30 pm for 7 pm talk start point. Organised by the IMechE. Some refreshments available from 6:30 pm. Questions and discussion due to finish at 20:30 but I'm happy to discuss any questions you may have for a bit longer. I will bring additional material so we have the potential to illustrate answers to questions. 4 Dec - 13:00 - 17:00 approx. Southampton University (Building 45 room 0045 which should be on the ground floor and is a large lecture theater - see site map here https://www.southampton.ac.uk/assets/sharepoint/groupsite/Administration/SitePublisher-document-store/Documents/About/visit/highfield_accessible_routes.pdf). Guests welcome and free. First lecture is similar to the one on the 2nd - Formula 1 performance, design, & aerodynamics. This does not require specialist knowledge. Would be suitable for higher school pupils, motorsport enthusiasts, engineering students and engineers. 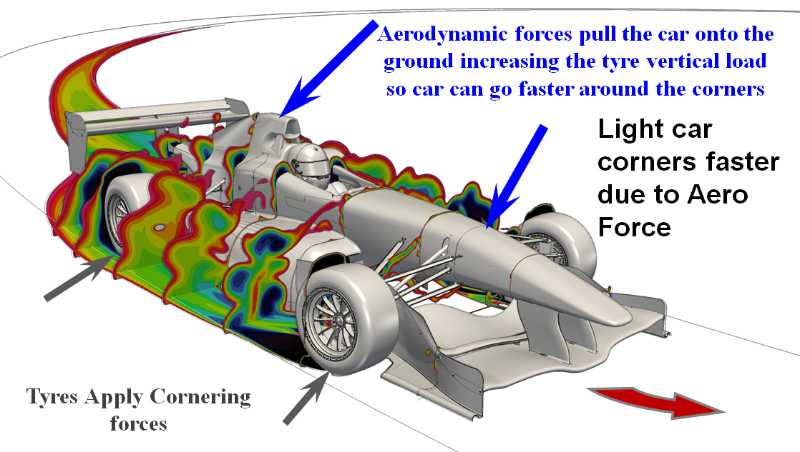 After the first lecture we then focus more on the use of CFD to develop a race car (aimed at university students but anyone using CFD may find it interesting) and how new aerodynamic testing restrictions (in the FiA regulations) are changing the approach F1 teams are taking to aerodynamic development. There will also be discussions with the Formula Student team which are probably not open to all.